Last week I had the privilege of attending a PLC conference at the convention center which had the best recycling stations. Yeah for eco-friendly services. So by day we absorbed a great amount of information-some days to explosion. And by night we explored the downtown Nicollet Mall neighborhood. As a crazy foodie person I had done my research on a few places to eat. I did NOT want to be stuck eating at chain restaurants or fast food. I went with a plan and had hopes that the teaching crew from Hansen would join or so their own thing. I knew my friend and roommate for this trip Beth would jump right into my foodie plan. 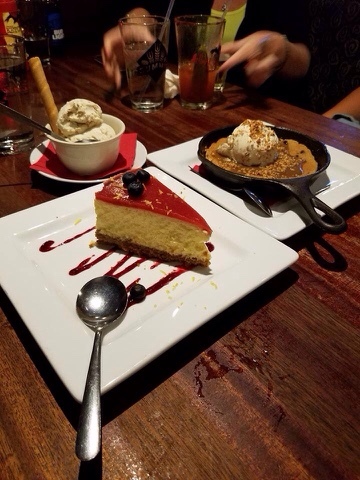 Hell's Kitchen: this has been on my list for quite awhile. Delicious. 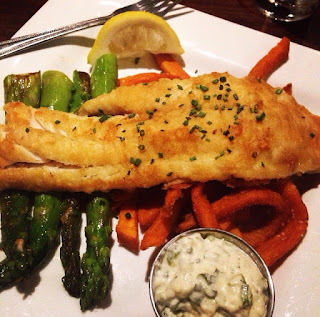 I had the walleye with asparagus and sweet potato fries. I was in Minnesota after all and my fish-obsessed nephews would be proud. We had fun drinks there and all 6 teachers loved their food as well. The Newsroom: another amazing choice. As the daughter of a newspaper man I loved all the news walls to look at throughout the restaurant. I had the ahi fish tacos appetizer as my meal. I didn't snap a photo-I must have been too hungry. There were three petite tacos and they were melt in your mouth delicious. Everyone enjoyed their meals here as well; most everyone else at the table chose steaks. 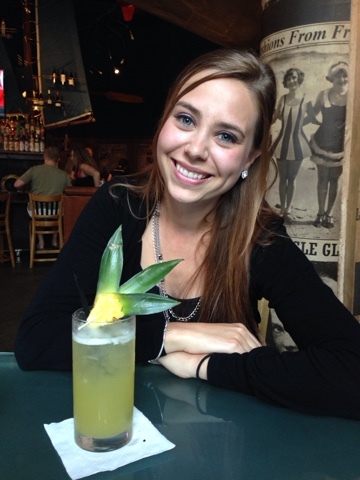 While I didn't take a photo of my food or drink I did snap a great shot of Caitlin, Pre-k teacher, with her pineapple rum drink. After both dinners we had fun at two close by clubs. At Brit's Pub we ordered beers and ciders while we watched the US lose to Argentina on their rooftop lawn! And then on our last night like everyone else at the conference we had heard about an amazing dueling piano bar The Shout House. Crazy loud, super fun, and it was 90's night. Can't get much better than that! I would return to any of these places with family/friends and am very grateful that my Hansen/Holmes family were willing to try these new places!